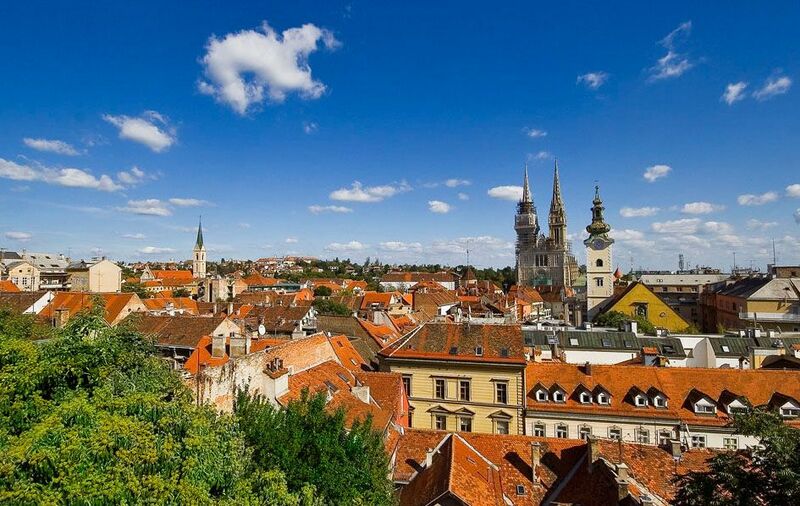 Zagreb is the capital of the Republic of Croatia and one of the oldest European cities, with a history stemming back to the 11th century. Since Croatia’s accession to the European Union in July 2013, Zagreb has also become the new metropolis of the European Union. Zagreb’s secret recipe for a successful meeting or conference, memorable incentive, or a fascinating event, includes a rich variety of carefully selected historic and modern venues, world class hotels, exciting gastronomic adventures, top quality PCOs and DMCs, highly professional staff and an excellent service. 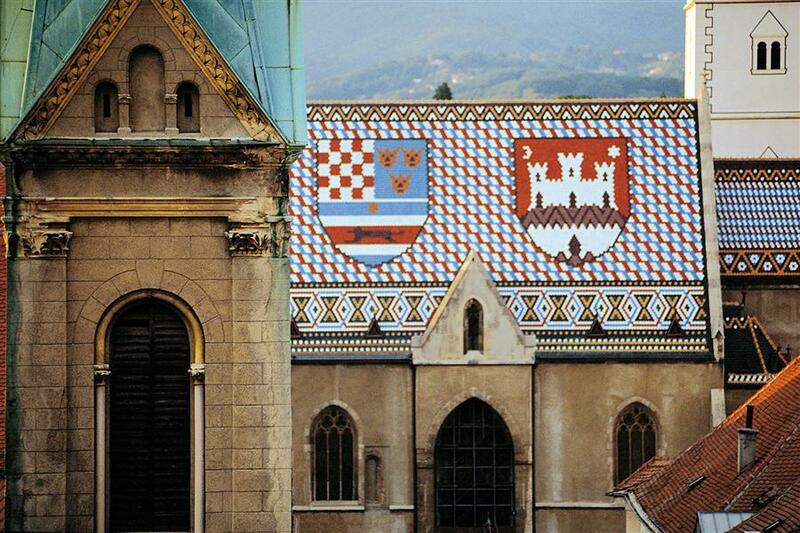 Combine them according to your preferences and wishes and you will get a unique, tailor-made Zagreb experience. The Concert and Congress Hall Vatroslav Lisinski was opened in 1973 and renovated in 1999. It consists of one large and one small hall respectively, and it is fitted out for congresses, meetings and other events. Congress Centre Forum Zagreb is a part of the Green Gold Business Centre. It has 10 multifunctional halls that can be interconnected to hold up to 375 delegates in total, theatre style. With six multifunctional meeting rooms, Doubletree by Hilton Zagreb has a suitable space for any event, conference, presentation, or small meeting. Utilise over 4,140 sq. ft. of versatile function space, including the pre -function areas and the beautiful Mimosa Ballroom, which can accommodate 250 people. The modern conference centre HYPO EXPO XXI is considered one of Croatia’s most attractive conference centres. 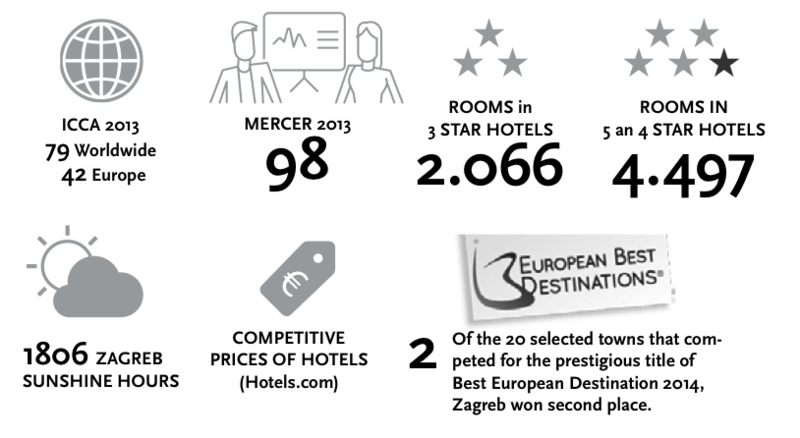 It is located in a business centre that is increasingly becoming a new and recognisable meeting point of Zagreb. Apart from its exceptional architecture, this multifunctional conference centre can be adapted to suit clients’ requirements and wishes. The Zagreb Fair Congress Centre, built in 1909, has one of the oldest congress halls in this part of Europe. It offers numerous conference and exhibition halls and has the potential to cater for larger events, with a capacity of 2,000 seats. The shortest cable car in the world, just 66 metres long, has for over a century been transporting the citizens of Zagreb between the Upper and Lower Towns. It was opened in 1890 and until 1934 it was steam driven. It has maintained its original look and construction right up to the present day, which is why it is now a protected cultural monument. Many events and musical performances, which from April to late September take place outdoors in the streets, squares and beautiful city parks, make Zagreb an especially lively destination. The famous spring and summer festivals, Promenade concerts, Dance Evenings, Folklore Festival, Flower Festival, open-air Film Festivals, Cest is d’best street performer festival and many others entertain visitors to the city. The numerous museums, galleries and art collections hold items of particular rarity, such as the Zagreb Mummy with the world’s longest text in Etruscan or the remains of Neanderthal prehistoric man (homo Krapinensis). Another “out of the box” concept and a must see museum is The Museum of Broken Relationships, which grew from a traveling exhibition revolving around the concept of failed relationships and their ruins. Teams get a camera and list of tasks to include in their movie. They will have to make good preparations, be creative and also cooperate with the friendly people of Zagreb. All of the films can be shown on the same day – during dinner! 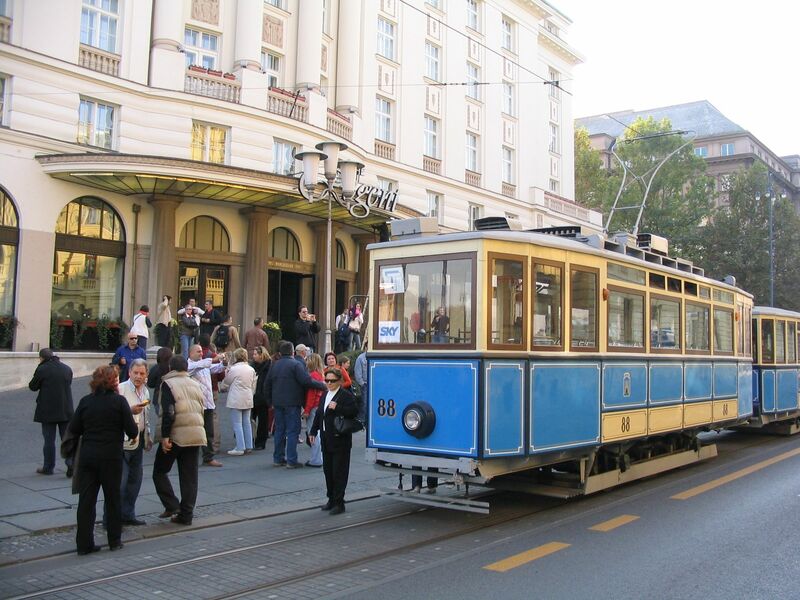 While you’re enjoying an exclusive Old Tram ride together with some Zagreb delicacies and a glass of sparkling wine or a hot wine with cinnamon and listening the violin player, the guide will introduce you the Zagreb Downtown and its beauty, which will take you back to Zagreb’s past. Exploring the culinary delights found in the historic Croatian capital through its farmers markets and gourmet spots. 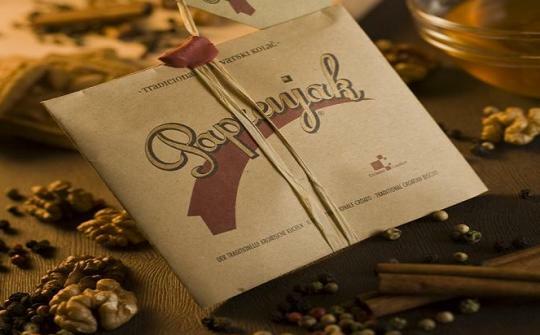 Locally grown organic products are transformed into a traditional Croatian continental meal. Become fully immersed in the art of cooking and entertaining, guided by Zagreb chefs and foodies. Direct action to found the Academy in Zagreb was initiated in 1860 by the Djakovo-Srem bishop Josip Juraj Strossmayer and up to this day the Croatian Academy of Science and Arts has organised more than one hundred scientific conventions. The Illyrian Stateroom (with a 220 seats capacity) is particularly attractive for business meetings, receptions and promotions, and it is today considered to be the most beautiful classical interior in all of Croatia. The Klovicevi Dvori Gallery is located in a building dating from the middle of the 17th century that was partly destroyed in a fire soon after it was built it. Since then the building has been constantly renovated and reconstructed. 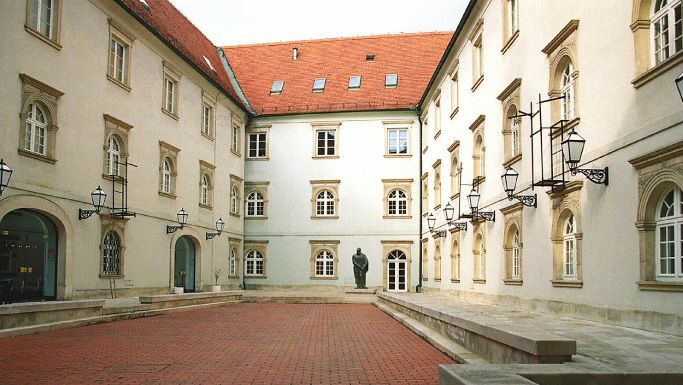 A former Jesuit monastery used for offices and archives, it was radically altered between 1974 and 1983, when it was transformed into a centre for art exhibitions. For the second consecutive year, the international tourism magazine Luxury Travel Guide has named Zagreb’s Phoenix Hotel as the most romantic hotel in Croatia. Alongside the 55 modern Superior and Deluxe rooms, of which seven are furnished in a special “romantic” style, there is also the Maestro fine dining restaurant, a wellness & SPA centre featuring an Indoor Golf & Fitness Centre, the magnificent Magic Hall banqueting area, with seating for 400 people, and the Dioniz wine cellar. Depicted in the novels of August Šenoa, a descendent of one of the first Zagreb pattiseurs, these biscuits have become a popular Zagreb souvenir. The same goes for licitar, most frequently heart-shaped, that many people find really tasty, especially when accompanied with medica and gvirc, drinks made of brewed honey and sold at church feasts. The first mechanical pencil (1906) in the world and the first solid ink fountain pen (1907) were invented by Mr. Penkala, a Croatian engineer and inventor. When in Zagreb, make sure to go to the shops at Jelačić Square in the heart of the city, where you can choose from a diverse assortment of products from the renowned writing implements factory.